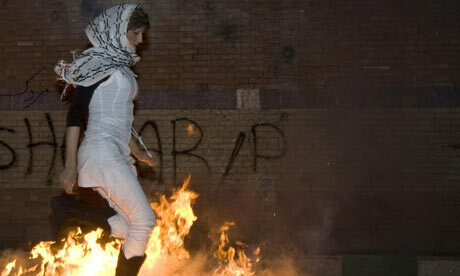 Network Announces: “Real Housewives of Tehran” to air in January. Home → Damien Zone → Network Announces: “Real Housewives of Tehran” to air in January. The third "Real Housewife of Tehran" gets torched! This sound-bite was issued by Bravo executive, Milt Silverman, CIP (Chief of Improbable Programming) for the network. If viewers chose to tune in in January, the already trashy network that gears its programming towards trashy people, will air the first episode of “Real Housewives of Tehran.” All the episodes had to be filmed in a week, but they got twenty in the can before all the cast members were executed by Iranian authorities. “It brings back old memories of Tehran when I fucked up with the hostages,” smiled Jimmy Carter as he attended an advance premier at Danny Glover’s house. In the first episode of “Real Housewives of Tehran”, Kinti Al Shabanderage, the wife of an oil executive, gets stoned to death when she wears a gold necklace in the presence of a man who was not her husband. The other women get so angry that they punch the stoners and are all shot at point blank range. The next nineteen episodes are films of people talking about the exectutions and how evil western clothes have ruined the Iranian country. “The show is wonderful and we Americans should learn more about the cultural greatness of Iran,” said a person who said he was speaking for Danny Glover who not available because he had to run out and protest against a Christian girl’s school that is making 8th graders wear uniforms. Real Housewives of Tehran, coming in Januray on Bravo!